Hello, my husband keeps a 226 gallon tank. Im not sure of many specifics, has two canister filters. We do frequent water changes. We have two Arowanas about 3 in long, only had them for a week. I noticed one of them floating on the bottom this morning. My husband tried some crickets and he ate a large one last night, I kind of thought maybe he ate too much. When I got home from work he was on his side. He's breathing but almost looks like he's gasping. But, he moved from one end to another end against a pretty strong current so I am assuming he swam. We weren’t sure if there was anything we could do to save him before it’s too late. We have also been feeding them guppies, krill, and blood worms I think. Not sure if it is related but we also have 2 clown knives. The one seems to be losing it’s color. It still has his dots, but is very pale looking and was once the typical sliver brown. He seems to be acting and eating fine. I don’t know if the two problems are related or not. Thank you for your feedback. I have offered him frozen bloodworms, earthworms, and tropical flakes at night when he becomes active. He is about five inches and very healthy. I have searched the web diligently, finding only similar instances where refusing to eat was a problem and have read that larger knife fish can be difficult feeders. I was hoping for some suggestions on how to get him interested in feeding, because I would really hate to lose the fish I was soo keen on keeping. Two days ago I purchased an African Knife fish after researching for quite some time and visiting pet stores. I purchased a 55 gallon aquarium setup and cycled it for ten days, took a water sample to be tested, and finally purchased my knife fish. It is quite healthy (busy at night and still in the day.) It has plenty of hiding places, but does not seem the slightest bit inclined to eat. So far I have offered him frozen bloodworms, earthworms, and tropical flakes at night when he becomes active. <Flakes are a bit of a non-runner to be honest. But earthworms should work. He is about five inches and very healthy. I have searched the web diligently, finding only similar instances where refusing to eat was a problem and have read that larger knife fish can be difficult feeders. I was hoping for some suggestions on how to get him interested in feeding, because I would really hate to loose the fish I was soo keen on keeping. I just bought a clown knife. and a love it to death best fish I've ever bought. However a live in a small rural town and the idiot at the local pet store didn't even know what kind of fish this is and therefore a cant trust anything he told me. I have only seen him eat a few times and a keep him with 3 tinfoil barbs which can sometimes eat live foods but a don't know if he is eating at all except the few I've seen him gobble up. I searched a bit online about feeding a know they like live foods and frozen/freeze dried foods but when feeding him live foods how many should a put in there? Do a just put all the feeders in there at the same time or just buy a bowl or something and keep em in that for a few days and just put a few in? will he over eat? will the Tinfoils eat them all? I have a 55 gallon tank well planted with silk plants, driftwood and fake rocks for hiding places, all of my levels are doing great and my water temp, is 79.4 F. I have a private well, so since my water is not chlorinated I do not use any chemicals in any of my tanks other than 1 TBSP aquarium salt per 10 gallons. I have had this aquarium for about one year. I have a couple dwarf gouramis, a gold Gourami, a couple small Bala sharks, 2 rainbow sharks, a red-tail shark, 2 Plecos, and a handful of assorted Corydoras. I recently added a African Knifefish (Xenomystus nigri). I had never seen this fish before and fell in love with him immediately. I had no trouble with him at all; I feed an assortment of flake, bottom-feeder shrimp pellets and I feed a mixture of brine shrimp and bloodworms at night, right before I shut the lights off. I loved him so much I went out and bought two more three days after I bought the first one ( I know now, from reading your site that that is WAY to crowded for three knife fish). That was 2 days ago. As of last night all three were fine; they ate well and were very active last night and yesterday during the day, I read on your site that these fish like to hide and are shy but mine were always out in the open, and they were vey beautiful. This afternoon when I left my house all three were fine; when I came home all three were dying, and now, at 3:51 am they have all perished. I have three tanks and all of my fish are healthy. I buy all of my fish at the same store and have never had any problems with disease. I had all of the same fish for years and didn't have to buy any at all but I have been changing tanks around recently and gave my son one of my 40 gallon tanks to take to his dad's and I sent a bunch of fish with it, so I have been slowly increasing my livestock. After reading your site I suspect the reason my fish died is because of aquarium salt? I cannot think of any reason for these fish to have died other that that. I change >50 water weekly and use activated carbon power filter that cycles 500 gal/hour. I just don't know what I did to cause the demise of these fish and I feel horrible!. I would like to get another African Knifefish but not until I know what killed these ones. 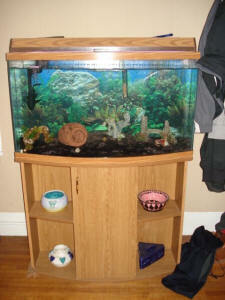 We recently bought a used 39 gallon bow front tank that was listed on a local auction website. The ad stated it came with a 9in clown knife fish and a 8inch needle fish. I did some Googling since I had never heard of these fish, and decided I only wanted the tank, but would take the fish too since they came with the tank and then give them away. When we picked up the tank the lady had already drained most of the water out of the tank. We brought a Styrofoam cooler for the fish. She filled that up and caught the fish and put them in. We left some water in the bottom of the tank We have had other fish tanks so I know I wanted to keep as much of their own water as possible. We went to the store and bought 35 gallons of steamed distilled water. We put that all in the tank and put the filter back on it, which we did not clean nor change the filter so we could try and keep much of the beneficial bacteria since we didn't have the means to cycle completely first. We put the heater in and warmed it up to around 75 degrees. We had also bought some feeder gold fish from Wal-Mart (bad place, I know but when it's 10pm you are left with little choice), which we put in while it was warming up. We put the clown and the needle fish in the tank, and the clown spotted (or sensed) the goldfish right away and started hunting, which I felt was a good sign. I noticed right away upon putting the clown in there that he was entirely too big for this tank and we need to get him a bigger tank ASAP. Oh did I forgot to mention once my husband saw him, he wanted to keep it. There was 11 feeders in there, the clown ate 2 with in an hour of being put in the tank and us sitting there watching him. The needle fish ate 2. We got the tank on Saturday, all the feeders that were in there were gone by Monday night. Tuesday I went to the local fish store and started picking their brains about the fish and what I could do to make it more comfortable. I bought some more feeders from them, goldfish for the clown and Rosey red minnows for the needle. and he saw the clown get one, then took it over to his corner and spit it out. The body that was left floating fit the same description as the others I have been fishing out in the mornings. I thought well maybe they are too big. The clown went after another and got it. My husband originally thought he swallowed it, but looked again and nope he spit this one out too. I just went and fished those two carcasses out of there. Currently there is one Rosey red and one gold fish left, and the gold fish is swimming but appears to have been swiped at by either the needle fish or attempted to be eaten by the clown. Can you give me some incite as to why he would be spitting them out? I am going to take my water to be tested hopefully tomorrow. I did buy some Amquel Plus to put in the tank to get rid of nitrates and ammonia. Should I be putting in aquarium salt in too? I bought 2 pieces of slate to try and give the clown a bigger place to hide, am afraid to stick my hands in the tank long enough to place them securely. He seems to get stressed if I turn the hood lights on, which I rarely do because I know they like the dark. Will this lack of light bother the needle fish? I will include the picture that was listed in the ad I bought it from. Oh and I forgot to mention this has sand in it instead of gravel, is that OK? There is also some black stuff, which the guy at the fish store told me it could be black and white sand mixed, but he wasn't for sure with out seeing it. I included a couple pictures of the clown also, hope they aren't to big. If you have any other suggestions I am all ears, as I am completely new to these kind of fish and you have to seem quite a bit of knowledge on them. <Neither Needlefish nor Clown Knives are "easy", and I suspect you're going to find these fish very challenging. Your first job is weaning them onto a proper diet; you simply cannot carry on with the Goldfish, so the fact they're not eating them isn't a problem. Let them starve for 3-4 days, and then offer something else, perhaps earthworms or mealworms. I find metal or plastic forceps really useful for offering such foods without disturbing predatory fish; for some reason, they'll ignore the forceps while being freaked out by fingertips. You could also try frozen lancefish, holding them in the current with the forceps and wiggling them enticingly. Needlefish go for "flashes" of silver, and once they bite, they tend to consume whatever they've caught. Clown Knives aren't too fussy, and some specimens even take pellets, but it's often a trial of wills at first. Thanks for your reply. I do feel a bit disturbed by your reply, but you gave some really good information overall, so I can get over being disturbed. Please understand that we got this tank and went on information given to us by the previous owner. We are feeding it what she told us, if nothing else we saved these guys by taking them out of an unknowledgeable home and brought them here, where we at least try to find all the information we will need for them to be the best fish they can be. After reading many sites I am fully aware of how big they can get and how much work they are, which is why I don't want to keep the clown. My husband wants to keep it and although I am the one who will likely end up taking care of it, if he wants it and we can house it then so be it. Like I said we have a 125 we are going to move it to. I would like to have that set up and properly cycled before moving it. Yes, I know even a 125 is too small. My husband is more than willing to get a 300gal tank. We have already started researching on where to get one of these monsters from. The needle and the clown seem to be ok living with each other. The clown sticks to the bottom and the needle to the top, but I do understand what you are saying about them not being good tank mates, when we move the clown the needle will not go with it. Again this is how they came, so we were going with very bad information. I will not feed them for 3-4 days. Can I try thawed frozen shrimp that comes in a bag at the grocery store or I thought I read in another reply they said shrimp off the ice in the coolers in the store. I will follow your tips to get them off the goldfish and Rosey reds. Can I use earthworms that you buy at a tackle store for fishing with? I feel there is no need to be rude here, I got these fish with the tank. They were obviously being mistreated by their previous owner, at least I have the sense to research more about them, so I can try and take care of the right way. I did not inspect any fish for any parasites or anything. I didnt know better and well you can change the past only learn from our mistakes and try to find better ways in the future, which is what I am doing emailing you. I had no idea, the guy at the fish store suggested I put it in so I did. I dont know what [the addition of salt] for. All I know is the previous owner told me she did it. I am trying to get all the proper information here, which is why I am asking questions. A simple no there is no need would have sufficed here. The filter is a Tetra-O FS 20-40, again this is what came with the tank, I am not claiming that it is a good enough filter. I don't know if it is or not. I don't know a lot o the care of these fish at all and thats why I am coming to you. I will take the information you have given to me and try to do my best. I actually have not found a whole lot of information on the needle fish, can you recommend some good reading on those?